When you are doing a post in Blogger, there are post settings on the right. A relatively new one is called "permalink". You have a choice of automatic or custom permalinks. If you go automatic the name for your post will be made up out of your title. 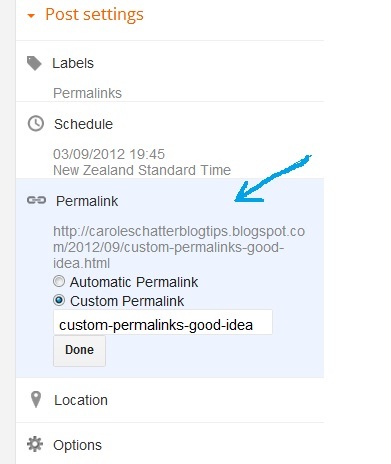 But I think it is better to use custom permalinks so that you have more flexibility about what you put in the title - and you can use the important keywords for the post in the custom permalink. In a custom permalink you can't use spaces or any punctuation except a dash. 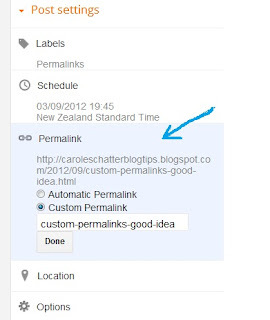 Before you get carried away, and decide to do new custom permalinks for your old posts - don't if there is any possibility that they are linked to other sites/posts - if you change to a custom permalink you will break all those links. Thanks for the tip, I had no idea you could do custom permalinks!